Let your creativity show through on this drawing pad of paper. 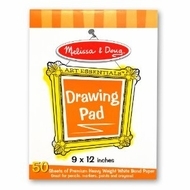 Great for pencils, markers, paints, and crayons. Includes 50 sheets of 9 x 12 inch premium heavy weight white bond paper.